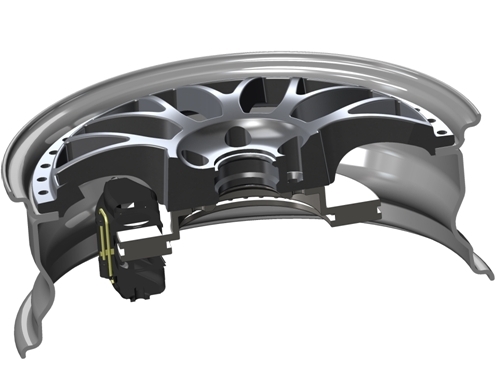 AUTOart’s 3-piece wheel is made of three components, including an outer rim, an inner rim, and a center disc bolted together with 35 to 40 assembly bolts. The outer rim, available in half-inch increments from 0.5 inches to 5.5 inches, is made of 6-mm-thick, 6061-series spun aluminum, heat-treated to T6 temper. The inner rim, available in half-inch increments from 4.5 inches to 10 inches, is made of 5-mm-thick, 6061-series spun aluminum, also heat-treated to T6 temper. Thinner rims may be used for racing applications to reduce weight. Even so, the center disc of our low-pressure aluminum casting is also made from heat-treated T6 alloy to ensure toughness in any conditions. We also offer different thickness of the back pad on the center disc to suit various types of large brake calipers, and a special adaptor kit is offered for the fitting of original-equipment tire-pressure monitoring systems. AUTOart prides itself on its wheel finishes. The outer rims are hand-polished to a mirror gleam, while the inner rim is natural matte gray. All center discs are sandblasted and chemically treated before the applying of one coat of powder primer, two coatings of wet paint, and then a final clear coat. All of our wheels are subject to VIA certification conducted in-house. The initial rim-spinning and the casting of the center disc, as well as the machining, painting, and final assembly, are all performed by AUTOart under one roof to ensure the strictest quality control. Disclaimer | Copyright ⓒ 2013 AUTOart Wheels. All rights reserved.